It’s a cold and rainy day here in LA, and nothing tastes better on a day like today than something hot and cheesy. I’ve made my meeshiladas for lots of friends and family, and they always notice something different about the filling. My background is Persian, Italian and Irish so I really have no business making enchiladas. Except for the fact that these meeshiladas are drenched in enchilada sauce , and come topped with cheese, they are nothing like the Mexican recipe. They may not be traditional, but my guests enjoy them for what they are, meeshiladas. First you’ll need to prep. Dice your onion and bell pepper. Open your can of beans. Take out your tortillas, and have them ready. Season your chicken with salt and pepper. Turn the heat on under your pan, and place a few tablespoons of butter or oil and your minced garlic onto the pan. Place your seasoned chicken into the pan, and start to cook. When the chicken has been cooking for five to ten minutes, or starting to get brown, add 1 jar of salsa to the pan. Let the chicken absorb the salsa. The chicken should start to become tender, at this point you can use your clean fingers or two forks to start to break apart the chicken. Add the diced onions, peppers, and black beans. Cook until the vegetables are soft on the outside, slightly brown. Preheat your oven to 375. Poor a bit of enchilada sauce into a lasagna pan. Take your corn tortillas, and warm them up. You can do this over the stove or in the microwave. Heat them for under 30 seconds, just enough to soften them. You can poor enchilada sauce into a plate or a pan, and lightly coat the tortilla in the sauce. Fill the tortilla with your cooked mixture, and roll it. If your unable to keep the tortilla folded on its own, a toothpick will help keep it closed while cooking. Just remember to remove the toothpicks before you serve. 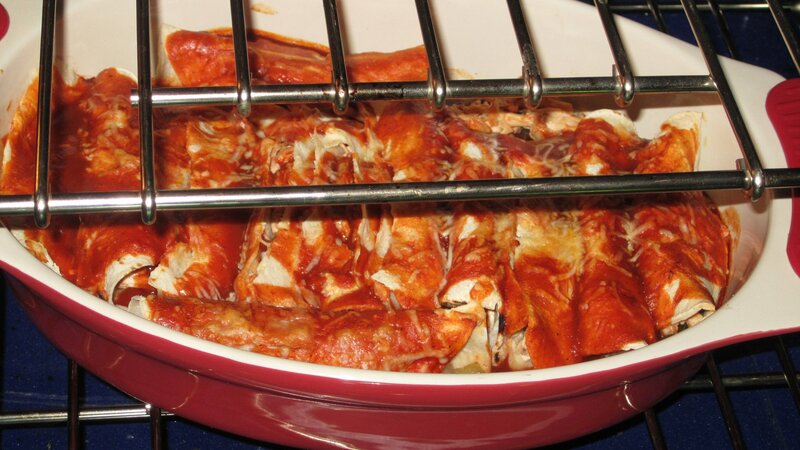 When you have filled your lasagna pan with your rolled tortillas, top them with more enchilada sauce and Mexican Cheese blend. Cook in the oven until the cheese is melted, usually no more than 15 minutes. Serve with sour cream and guacamole.